I'm really not sure what the point of showing this Anime on CR is with this level of censorship. It's clearly gore/suspense driven much more than plot or creative sci-fi ideas or action scenes. It's like showing Hayate the Combat Butler without the gags or Transformers without the robots, Star Wars without light sabers, strawberries without whipped cream. Censorship in anime is used primarily by the studios to get Blu-ray sales. It's going to be a great series if it stays true to the manga, and yes it's going to be censorship heavy. If you don't like the it, then support the studio by buying the Blu-rays. I would still wait for it on disk! UPDATE: I was asked to reevaluate.There are 77 reviews that rate this show a 3 or below,(raised mine to 3) I am sure my review which sited its overly used black lines and cut away scenes is not hurting the show itself. And as I recall from this latest show it is still using cut away shots, bloody fists, and too heavily shadowed to tell what they are gross bits to avoid showing much gore. What does show is pretty well drawn and appropriately placed though, its not much of a caveat but I will give it that. It may not be as bad as it was, but I am still less than impressed. I will say that the backdrop stories are becoming deeper and more elaborate at an inappropriate time. This is a show with lot of potential if handled correctly though it appears this will not be the case, it could have become an "action gore" type cult classic. I would love it if there was a season two and they fixed the mistakes they are making here or if there is a alternate story line on a br that fixes some of what has gone astray. I still say wait for br. But thank you very much for asking for an updated opinion. The censorship is NOT CR's or the producers fault. This anime is awesome, as is the Manga. Anyone who thinks that the censorship is some kind of sales gimmick has absolutely NO idea about the strict censorship laws in Japan. CR gets what is aired on Japanese televesion for these shows, so they can't edit the footage in anyway. Stop blaming them AND the producers, they have zero control over any of it. So far after the OVA and the first episode I think this has the potential to be an awesome show, So far the characters seem kinda cool and the action is really cool. The story involves Giant Mutated cockroaches and Mars so ummmm yeah..... With only 1 episode out so far I can't really say much more. I think you should give this show a chance if you like Sci fi and dark shows with cool action then watch this. Wow this show has been really excellent so far and we're sadly nearing the end. Thankfully the censorship is no longer a problem at all so if you haven't watched this show yet only because of the censorship well start watching because the censorship is all gone! and because it's an excellent dark and gory show. So far so good with regards to the first episode which starts from the third arc of the manga. The first two arc's encompass the storyline of the first two Mar's missions and an introduction into terraforming mars with oxygen producing algae. The terraformars story is for the most part the third arc and that is where the first episode starts. This anime should encompass from 24 to 50 episodes in order to compliment the one of the best mangas ever written. This is Hands down a pretty gory anime. A lot of people die, (even your favorites) hopes are crushed, and every single one of them has some sad background story to tell. Regardless I find it to be an interesting anime and manga to read or watch, but that's just my opinion. If you like watching humans and human-sized cockroaches get beaten and battered, be my guest. 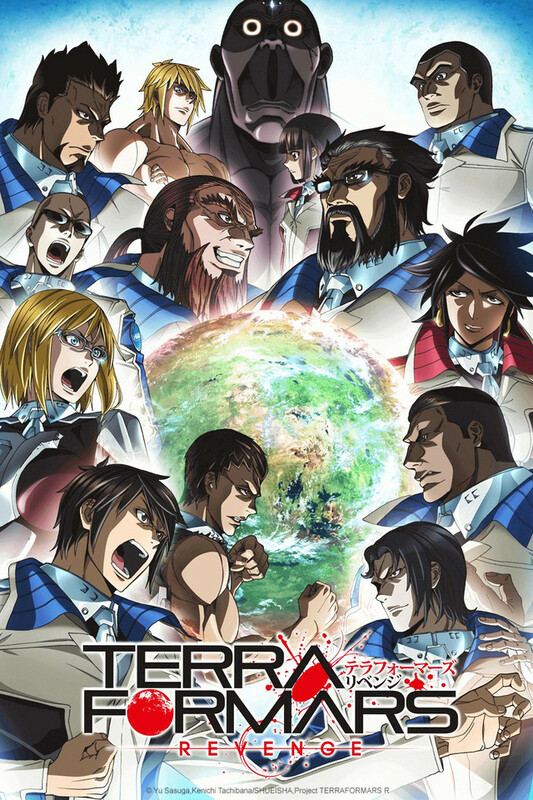 As an updated Terra Formars manga fan, I can definitely say that the anime adaptation to this series is well-done. Starting with the Pacing: Considering that it is a 13-episode anime, I actually like the fast-paced approach. It skips mainly the supporting character backgrounds, which I think is actually pretty good to get the main stuff going already. Storyline: Even if the OVA series contains vital stuff for the story of the anime, I still think that you can enjoy and understand the story of the TV series without watching it. Animation: The animation is pretty solid and of movie-quality. The dark animation theme also suits this series well. Music and Theme Song: Good stuff, backround music matches the scenes well, especially the action scenes. The ending theme is pretty good and kind of reminds me of the 2nd ending of Attack on Titan. By the way guys, stop saying that this is an AoT rip-off. Yeah, it kinda resembles AoT in a way that it also has a group of soldiers fighting giant threats in the form of humanoid cockroaches, but they are entirely different, Terra Formars has a story that stands on its own. Finally, the Censorship: Well, yeah, I think that it was done to boost the DVD/Blu-Ray sales. It kind of lessens the darkness factor but I don't think it completely ruins the scenes. Just Enjoy it! There you go! That's it for my review. Thanks for reading it!